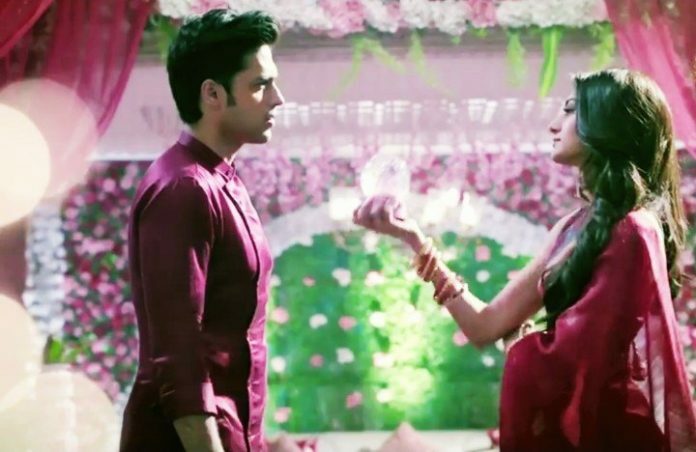 Star Plus Upcoming Kasautii Zindagii Kay: Komolika tries to make Prerna jealous by revealing about her honeymoon plans. She asks Prerna to accept her failure. She tells Prerna that she has checked into the hotel and now she is close to her victory. Anurag gets helpless to favor Komolika. Prerna smartly learns about the hotel location by provoking Komolika. Anurag tries to get into the drama so that he can impress Komolika with his love. He also wants to irritate her by his overfed love. Komolika plans to charm him by her stunning look. Prerna plans to put a break on their romance by sending the police at the hotel so that Komolika can learn a lesson of her lifetime. Anurag and Komolika have a romantic dance. He thinks he is in big trouble as his respect is at stake. He doesn’t want both his wives to fight for the honeymoon challenge. He finds hard to keep Komolika away from him. He makes silly excuses and goes away, while she gets troubled by the police raid. She doesn’t like to accept the insult. Anurag fails to help Komolika. They both fail to explain the police and land in police station. Komolika’s honeymoon plans get ruined. Inspector poses cheap questions at her and insults her for her crime. He demands her to confess the crime. She tells him about her contacts and political reach. She calls up her dad to take his help. Anurag knows that she will always win by her dad’s help. Chobey doesn’t answer her call. Komolika gets worried and calls Mishka for help. She informs Mishka about the mess in which she has fallen. She asks Mishka to free Anurag and her from the police. Mishka laughs on her misery. Komolika wants to prove that she is Anurag’s wife, not his mistress. She asks Mishka to just come soon. Mishka doesn’t want to ruin Prerna’s plans. Anurag enjoys his stay in the police station after watching Komolika’s tension. Anurag tells the inspector that they are really husband and wife, but he has no proof. Anurag fails to show any marriage proof. He asks inspector to call up his family once and find out the truth. Prerna realizes Anurag’s move of seeking help. Mohini fails to answer the inspector’s call. Prerna answers the call and learns about Anurag and Komolika’s arrest. She arrives at the police station to defame Komolika and teach her a lesson. Krishna tells her brother that she will meet Veer and handle the work. He rushes for some urgency and asks her to go home safely. She wants to avoid Veer, but destiny brings them together again. On the other side, Shuklain wants to talk to Krishna for a purpose. She calls Krishna’s Bua and asks about Krishna and Veer’s love affair. Bua tells her that its nothing such and Krishna knows her limits. Veer calls Krishna home for help. She reaches the house and learns that none of the family members are home. Veer then takes her by a surprise when he proposes her for marriage with much love and respect. He promises that he will never leave her and their separation will be impossible for anyone in the world to create. Krishna doesn’t listen to him and scolds him for breaking his limits. He tells her that he is practicing his love proposal for Shivani. He reminds her the duties of a wedding planner and asks her to help him in conveying his feelings for Shivani. He asks her if she is really getting flowed in his emotions. He compliments her that the ring is just perfect for her. He charms her and tells her that he can never let her get hurt. He helps her in removing the ring. He asks her to help him in making a special cake for Shivani. They have lovely-dovey moments while they prepare the cake. Veer knows Krishna is getting influenced by his strong presence in her life. Krishna gets speechless to answer her and runs away. She doesn’t want to accept her feelings for Veer. He promises to keep her happy once she accepts his love proposal. Krishna denies her feelings once again. He tells her that her feelings will be known to her and the entire world when his marriage functions begin. He is sure that she will admit his feelings during the haldi function. Shivani gets a surprise when Veer proposes her for marriage. Shivani likes his lovely surprise. Veer gets confident of Krishna’s feelings and tells her that he will make her accept his love at any cost. Krishna gets flowing in her emotions. Shivani realizes their budding love and gets revengeful against Krishna.